ROCHESTER, N.Y. — About $1 million in funding went into establishing the Frederick Douglass Resource Center, but the building now sits vacant; doors locked and phones disconnected. “We have not found the funds to keep it open, maintain some type of a staff and therefore you have ceased operations,” said Errol Hunt, property owner and former pastor of Rochester’s African Methodist Zion Church. Chamber of Commerce CEO Bob Duffy was the mayor when the Douglass Resource Center officially opened back in 2009. He says it was supposed to house artifacts of the abolitionist. “I will certainly ask questions and see what we can do and as opposed to pointing the finger and the blame I think we should find out what needs to happen and get some very passionate supporters behind and bring some life back to it,” Duffy said. Former mayor Bill Johnson, who was in office during the process of the resource center being built, says it should be a public institution. 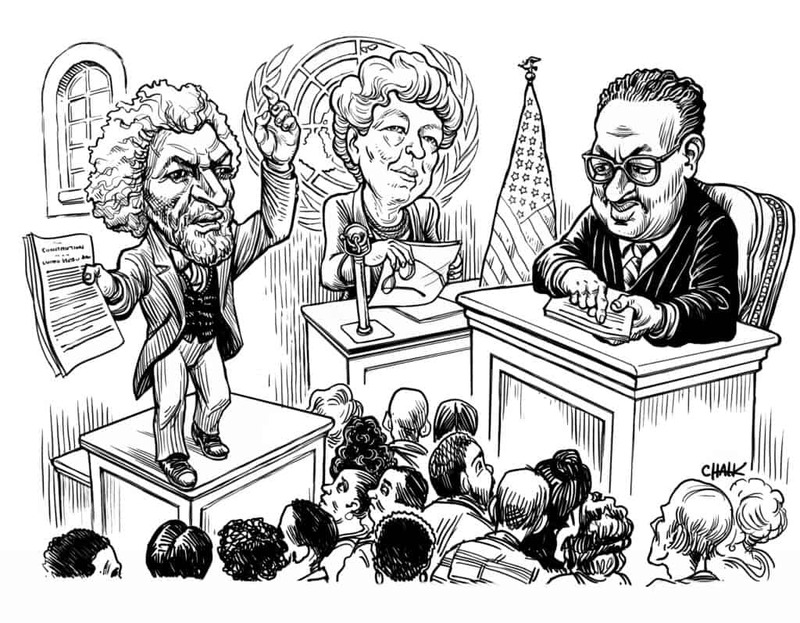 The lack of a museum here Rochester is even more disappointing to someone who has dedicated a majority of their life to preserving Frederick Douglass’ legacy. “It angers me because so much has taken place here and we keep losing not just Douglass memorabilia, but we lost the whole picture,” said Dr. David Anderson. Rochester’s year-long celebration of the Douglass’ birthday bicentennial has the city wanting more. I participated in an online discussion on the Facebook on the page of Rachel DeGuzman for about an honor before Mrs. DeGuzman suppressed the conversation. In the thread Carvin Eison mentioned this resource center has been, in essence, closed to the public since 2011. This is the second such Douglass-themed center in Rochester, New York. This summer, join Maryland Humanities at its 24th annual Chautauqua living history series, with three performances at the Chesapeake Bay Maritime Museum. The theme of Chautauqua 2018 is “Seeking Justice. This program also serves as part of Maryland’s bicentennial of Frederick Douglass’s birth. CBMM is proud to be a part of this year-long celebration, as we share the stories of Frederick Douglass through the Mitchell House exhibition and programming throughout the year. The 2018 Chautauqua Summer Series at CBMM is generously sponsored by Karen and Langley Shook, and is funded in part by a grant from the Talbot County Arts Council, with revenues provided by the Maryland State Arts Council, Talbot County, and the Towns of Easton, Oxford and St Michaels. On Thursday, May 24th an event organized by Baltimore Mayor Catherine Pugh’s office and the Preservation Society of Federal Hill and Fell’s Point will officially announce the installation of Frederick Douglass Bicentennial Banners throughout the Fells Point neighborhood in Baltimore, Maryland. Historic Fells Point is where a young Frederick Bailey ran with the “Point Boys,” purchased The Colombian Orator from radical bookseller Nathaniel Knight, worked the docks, attended church, possibly taught nigh school and fled from slavery. Frederick Douglass-Isaac Myers Maritime Park and Museum. Yesterday I had the chance to visit the Rochester Historical Society and speak with hybrid historian-librarian-archivist William Keeler. During my visit I reviewed materials related to the life and times of Frederick Douglass in Rochester. In speaking with Bill I learned the Rochester Historical Society is in the midst of a letter-writing campaign to both Rochester Mayor Lovely Warren (D) and Monroe County Executive Cheryl L. Dinolfo (R). I gladly signed the letter using both my DC address and Monroe County address. It is my understanding there have been ups and downs with the RHS over the years, much like the Historical Society of Washington, regarding collections, location and leadership. Nonetheless, any and every Douglassonian should take notice of the appeal by the RHS and offer their support of an institution of vital import to the field of Douglass Studies. It is my belief, no true scholar can begin to understand Douglass until you understand the communities in which he occupied space from the Eastern Shore to Fells Point to New Bedford to Rochester to Old Anacostia. Thusly, although small in numbers Douglassonian scholars must do what we can, even if that is as simple as affixing our signature to a letter, to support local institutions. In future posts I plan to share some of the material I discovered with Bill’s assistance. The surveying of Rochester continues today with a meeting with an old school journalist from the Democrat and Chronicle and visit to the Central Library in Rochester.